The Atlanta Hawks have started to gauge trade interest on forward Josh Smith(notes), and Smith isn't averse to ending his seven-year stay with his hometown team, league sources told Yahoo! Sports on Monday. Smith hasn't requested a trade, but has privately told league friends that the Boston Celtics, New Jersey Nets, Houston Rockets and Orlando Magic are his preferred destinations should the Hawks decide to move him. There's been growing acrimony between Smith and the organization, sources said, largely because of the feeling that Smith has been too convenient of a scapegoat. 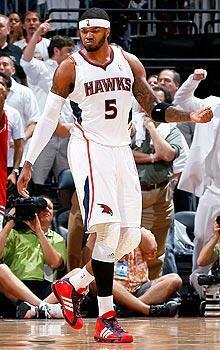 Smith had one of his most complete seasons for the Hawks, averaging 16.5 points, 8.5 rebounds and 3.3 assists. Payroll is an issue for the Hawks, too, and Smith's contract – which has two years and $25.6 million remaining – is an attractive target for management to unload, if, for no other reason, than the five years, $110 million left on Joe Johnson's(notes) deal is far more difficult to move. The Hawks have looked to identify veteran players near the end of their contracts, sources said, but have had no serious discussions on trading Smith. "They're looking for a change," one Eastern Conference executive said. "They would die to be rid of Joe Johnson's contract or move Smith, but they won't give [Smith] away. They want something in return." Dwight Howard(notes) has been a proponent of the Magic trying to make a deal for Smith, a childhood friend, but general manager Otis Smith is low on assets. Houston has long been intrigued with Smith, but like Orlando and New Jersey, also probably doesn't have the right pieces to make a trade. Hawks GM Rick Sund has long coveted Kevin Garnett(notes) and Ray Allen(notes) – two aging Celtics entering the final years of contracts – but Celtics GM Danny Ainge has yet to show an inclination to break up his core for next season. With an eye on drafting Arizona's Derrick Williams, the Indiana Pacers have discussed a package including center Roy Hibbert(notes) and the 15th pick for the Minnesota Timberwolves' second overall pick, league sources said. Nevertheless, the overture hasn't gained traction in Minnesota. …The Los Angeles Lakers and Sacramento Kings are two teams with interest in prying Raymond Felton(notes) from the Denver Nuggets, league sources said. The Nuggets believe strongly in Ty Lawson(notes) as their point guard, and Felton, with a $7.5 million expiring contract, is expendable. …Houston continues to offer the 14th and 23rd picks in the draft to move into the top 10, and could have a willing partner with the Detroit Pistons at No. 8. The Pistons have told teams they won't trade down until they see who drops to them on draft night, sources said. In what could be an interesting window into the Pistons' preferences, San Diego State forward Kawhi Leonard worked out for Detroit on Monday, and shortly thereafter cancelled his Wednesday workout with the Milwaukee Bucks, who have the 10th pick. Several executives believe Leonard may have left Auburn Hills with a guarantee. …Perhaps no player is rising faster than Georgia Tech's Iman Shumpert, who is suddenly on the Phoenix Suns' short list at No. 13. The Nets have had a strong interest in him, and he could be the player they're trying to move up from No. 27 to get. …The Suns have been willing to take back a so-so contract for Vince Carter(notes), if it included a first-round pick in the 2012 draft, league sources said. This hasn't happened, and as the Arizona Republic's Paul Coro reported, the Suns will buy out the final $18 million season on Carter's contract for $4 million. …The Utah Jazz are under immense public pressure to draft Jimmer Fredette at No. 12, but league sources said the front office remains focused on Florida State's Chris Singleton, perhaps the best pure defender in the draft. Several teams believe Singleton could go at No. 9 to the Charlotte Bobcats. As for the Bobcats, one Eastern Conference executive said: "The whole team is available." …Providence guard Marshon Brooks is getting a close examination by the New York Knicks at No. 17. His scoring ability continues to impress executives. Yahoo! Sports' NBA reporter Marc J. Spears contributed to this report.